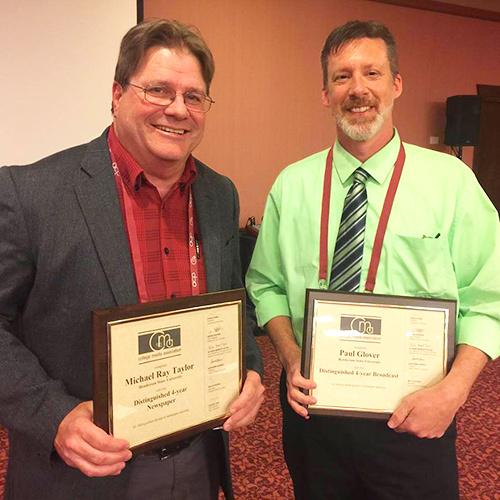 Paul Glover, associate professor of communication at Henderson State University, and Michael Taylor, professor and chair of communication and theatre arts, received the Distinguished Advisers awards at the College Media Association’s annual fall convention in Louisville, Kentucky. These awards are given to an adviser who has five or more years experience in college student media advising, has distinguished service in a particular area, and is an adviser at the time of the nomination. Henderson was the only university attending to have two advisers receive awards at the ceremony. Scott McKinnon, lecturer of communication, conducted a session on drones. Steve Listopad, lecturer of mass media communication, also presented a session. The multi-day convention included networking opportunities, informative panel discussions, hands-on tutorials, and access to media professionals. The event covered all aspects of college media, from rapidly changing multimedia platforms to newspaper, broadcast, yearbook and magazine journalism. Advisers were offered special programming focused on their specific challenges.